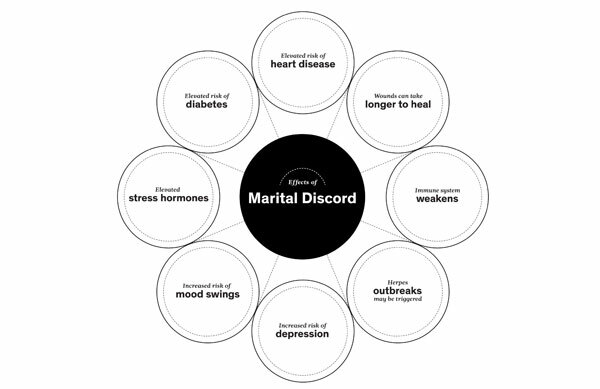 Research increasingly points to significant health consequences of marital stress as well as the benefits of healthy marriages. A study involving more than 5,000 people in South Florida showed couples can learn skills to create and sustain healthy, happy, lasting marriages. Graphic: New York Times. In 2006, PAIRS Foundation received a multi-year grant from the U.S. Department of Health and Human Services, Administration for Children and Families, to conduct a demonstration and research project in South Florida to deliver brief relationship skills training and marriage education to couples, singles and high school students. To date, more than 5,000 people have participated, including many on the verge of separation or divorce. PAIRS Foundation collaborated with Dr. Andrew Daire of the University of Central Florida’s Marriage and Family Research Institute to implement multi-year evaluation to understand the impact of PAIRS classes. Follow-up assessments of participants in PAIRS Essentials classes have consistently demonstrated statistically, significant lasting improvements in relationship cohesion and stability, with enduring benefits that show up through decreased conflict and increased relationship pleasure. Results have been especially significant for both individuals and couples who enroll in the 9-12 hour classes with high levels of marital discord. As research continues to expand our understanding of the emotional and physical health consequences of ongoing martial distress, knowing that couples from diverse socio-economic, cultural and religious backgrounds can achieve enduring benefits from brief educational programs should provide vital information to individuals contemplating marriage as well as those experiencing symptoms of relationship breakdown. research projects and majored in Psychology.